Seward Ltd., manufacturer of the world leading range of original Stomacher® laboratory paddle blenders and accessories used in sample preparation for microbiological analysis, has launched a new range of instantly soluble, sterile media products. Insterprep® granulated media bags and sachets have been introduced to speed up and simplify sample preparation for microbiological analysis of food samples, with preparation times as low as one minute or less. Developed by two of the most trusted names in food microbiology - Seward and HiMedia Laboratories - the highly respected manufacturer of laboratory culture media – the Insterprep (Instant Sterile Preparation) range has been created to help laboratories cut waste, increase capacity and respond to varying workflow requirements. Manufactured to ISO standards, Insterprep has been tested and proven independently by the world renowned Leatherhead Food Research Agency. Insterprep’s pre-weighed and sterile granulated media is instantly soluble, enabling extremely fast preparation times. The Insterprep media bag range comes with the correct amount of granular media sealed in a Stomacher bag ready for instant use. The user simply selects the Insterprep media bag required, adds sterile water and sample before placing directly into a Stomacher laboratory blender for immediate blending. No waiting is needed for the media granules to dissolve prior to blending, so samples can be prepared in under one minute. Also included in Seward’s new media range, Insterprep sachets contain instantly soluble sterile media granules which are ready-to-use by adding directly to the user’s own Stomacher bags. The sachets can be selected depending on the quantity and type of media required for a particular protocol. 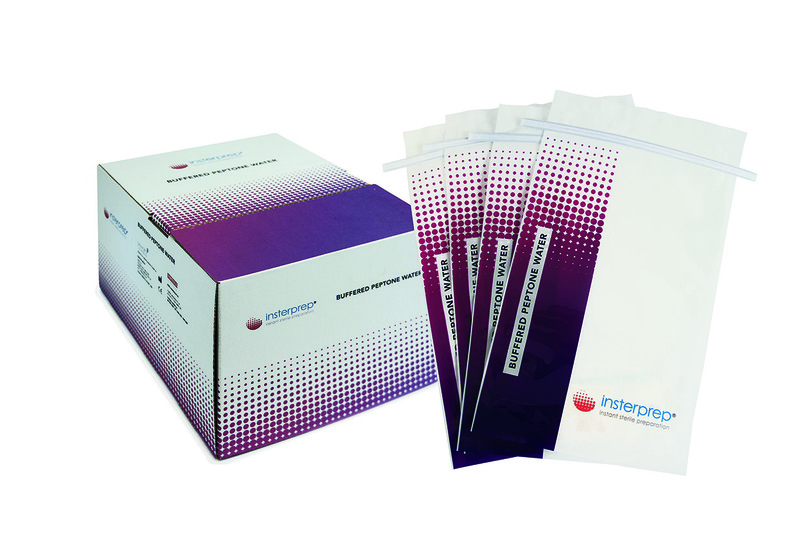 Current media varieties available in the Insterprep range include Buffered Peptone Water, Max Recovery Diluent and Fraser Broth. All are frequently used in the sample preparation of food for microbiological analysis for organisms such as: Listeria, Campylobacter, Salmonella, E. coli O157:H7 etc. As they are supplied in instantly soluble granular format, unlike powdered media, Insterprep granules have low odour and powder residue. Furthermore, they are easy to ship and store as opposed to prepared liquid media.